You Save: $14.00 (56%) Ships in 1 day. VHS or DVD, 90 minutes. Step into the beer culture of the 1950s and 60s, when virtually every local brewery in America was struggling for survival. In their fight against the big boys, small town breweries enlisted television as their primary weapon. 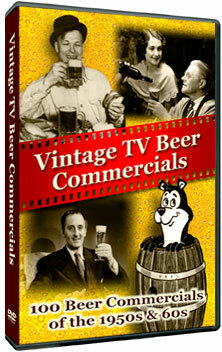 This wonderful video is a record of that historic battle, containing classic beer commercials like the Hamm's Bear, Bert & Harry Piel, Mr. Magoo for Stag Beer, Mabel--Black Label, and dozens more. It's a truly unique piece of beer history, and loads of fun. Perfect for parties and beer tastings. Available on DVD or VHS. » See more videos on beer and brewing.